It isn't often I pick up a book of essays to read, but occasionally I find they make good in between reading--even better than a short story collection in some ways. The essays are short and perfect for those moments when you don't have a lot of time to spare but must get in your reading. Although it took me a few months to make my way through Ariel Leve's collection of essays (I read it in between novels and short stories) , it was an enjoyable read, nonetheless. Leve's humor shines through in each essay and yet I couldn't help but catch a bit of sadness underneath as well, however unintentional (and maybe that's just me). 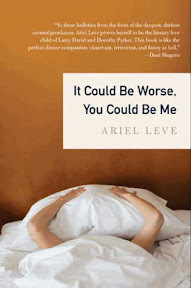 Journalist Ariel Leve compiled a series of essays about her life and thoughts into It Could Be Worse, You Could Be Me. She contemplates giving up coffee when she discovers it improves memory, discusses the bias against napping in bed, and why looking forward to anything is overrated. The author is a self-described worrier. My favorite section of the book, and the one I could most relate to was the one where she discusses health issues. I'm not so sure I'd go so far as to say I enjoyed that colonoscopy though! As I read this collection, I found myself relating to some of the stories the author shared. Maybe a little too well. Taking compliments, for example--neither Leve or I are good at accepting them. And evidently we both have that constant scowl or lack of a smile on our face because people assume something is wrong just because we aren't smiling. And like Leve, I hate it when people tell me to cheer up just because I am not wearing that expected smile. There were other essays I was less able to identify with, but they were no less entertaining. I have two friends who share the same life philosophy as Ariel Leve and could see them in every story. I am trying to decide which of them to loan the book to first . . . Source: Book provided for review by publisher. I don't think I would have given this book a second glance in the bookstore, but your review has persuaded me otherwise. I have not read many essays, but I have been meaning to do so and this just might be the perfect place to start. I love the title; it gives a good indication of the self-depricating humor one apparently finds within. I think this would be great for the car - I have to check and see if it's on audio! Good Lord she sounds like me! I like Jill's idea...need to see if this is on audio. This sounds like such an interesting book. I'm putting it on my list. I should have guessed it was a Harper Perennial -- they have a knack for picking winners. I am also a worrier and have some of the same issues that she does, so this book sounds like it would be a really interesting read for me. I like the idea of short essays to read between longer books, and will have to check this out. Thanks for the excellent review! I think I could relate to those essays too. This one sounds really interesting to me...I've never really read a book of essays before. I've never read any essays before. This sounds like it may be a good and interesting place to start. Thanks. I enjoy essays, and this book sounds like just my thing. Thanks for the review, Wendy! Now, this sounds really good and I like it! Wait, quitting coffee? No way... Hmmm... and "looking forward to anything is overrated"? Really? I'm totally interested in this book. Thanks for the review, Wendy! Sounds like I would relate well to this one! Molly - I might not have thought to pick it up either had I not read a blurb about it online. I read essays so rarely, but I've had good luck with them when I do. Jill (Rhapsody) & Sandy - The title is very fitting. I hope you can find it on audio. With the right narrator, I think it could be quite entertaining. Yvonne - It was interesting--and a nice addition to my reading. Beth - They do, don't they? I've enjoyed reading their books. Joy - This was a good collection. I liked that the essays were on the short side. I am feeling good, thanks for asking. I wear out easily, but I'm doing better than I was during that first trimester. I imagine the tiredness will be coming back soon enough . . .
Alice - The author really has an interesting take on life. I love her sense of humor. Kathleen - I hope you get a chance to read this someday. It's quite entertaining. Trish - Yes, first impressions can be deceiving. I don't think anyone's ever assumed I'm a snob because of my shyness, but I do know sometimes people think I'm fragile (which I'm not)--and no one expects my dry sense of humor when I let it loose. As you said though, once someone gets to know me, I'm not what you expect!